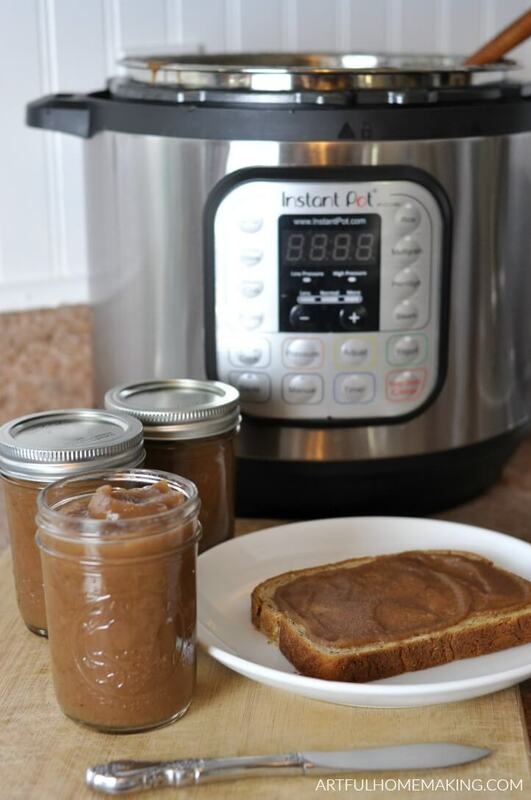 Instant Pot apple butter is simple to make and this recipe has no sugar added! 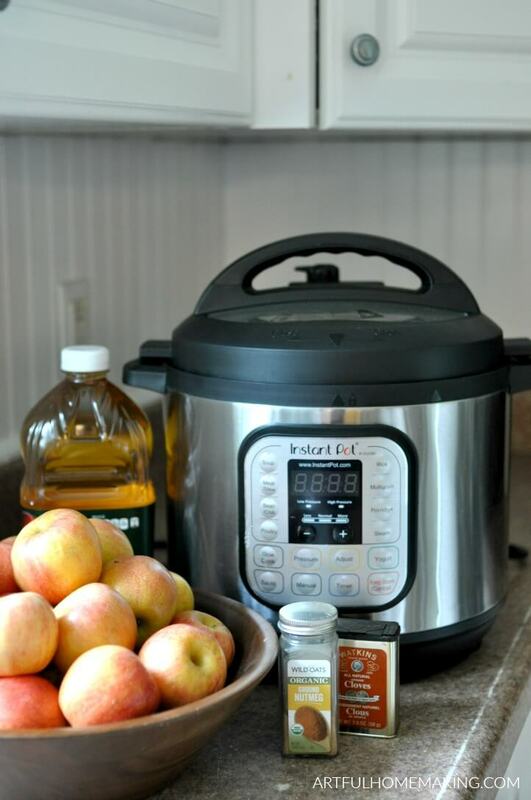 Save time by making apple butter in your pressure cooker. Last week my husband stopped by a local orchard and brought home three huge bags of apples. They were a good price because they were supposed to be “seconds,” but they tasted delicious, and they looked almost perfect. Gala apples are my favorite, and I was so happy to have all these delicious apples for recipes and eating raw. After making apple crisp and a few other apple concoctions, we just had a small bowl of them left. I decided it was time for some apple butter. I love making apple butter, and I’ve made it several different ways through the years, like this recipe made in the oven, and also traditional apple butter. 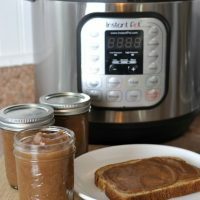 Instant Pot Apple Butter is now my favorite recipe! It’s so much faster and simpler overall. This recipe doesn’t make a huge batch. It just makes a little over three half-pint jars full. 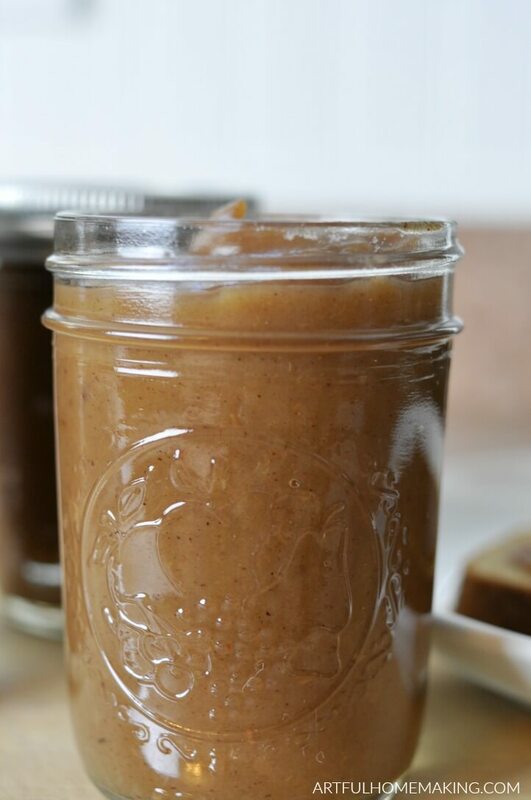 A small recipe like this is perfect if you just want some apple butter in a hurry! If you’re wanting to can it, you could try doubling the recipe so you get more for your efforts. Here’s a list of the supplies and ingredients you’ll need to make apple butter in your pressure cooker. 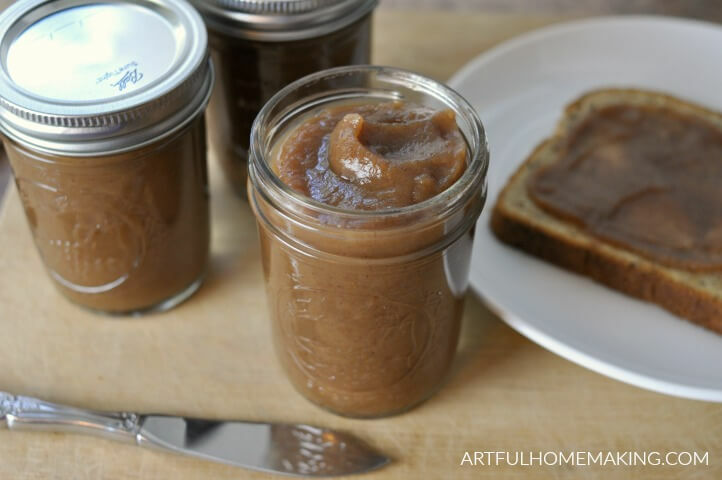 One of the things I love about this simple apple butter recipe is that you make it all in just one container. Pretty much all of the mess is contained inside the pressure cooker insert. That means less work when you’re cleaning up! First, peel, core, and slice the apples. 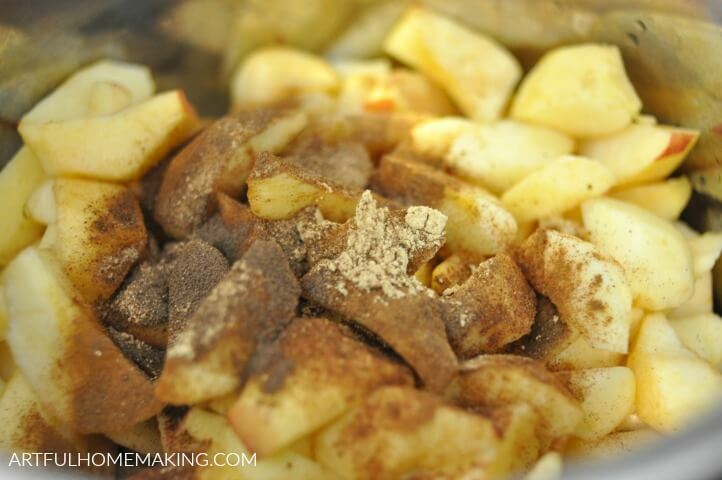 Add the apple slices and the spices to the Instant Pot insert. Add the apple juice, and turn on the Instant Pot. Set vent to sealing and adjust time to 20 minutes at high pressure. 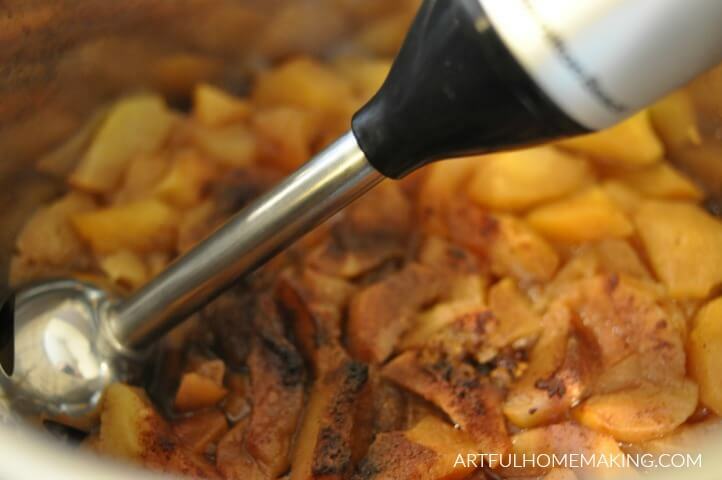 After the apples and spices have cooked in the Instant Pot, do a quick release to release the pressure. Then use your immersion blender to blend everything until it’s smooth. You want it to be free of any lumps. Turn the Instant Pot to the saute setting (on low) and cook and stir until the apple butter thickens. Be careful during this process, as the hot apple butter can splatter. 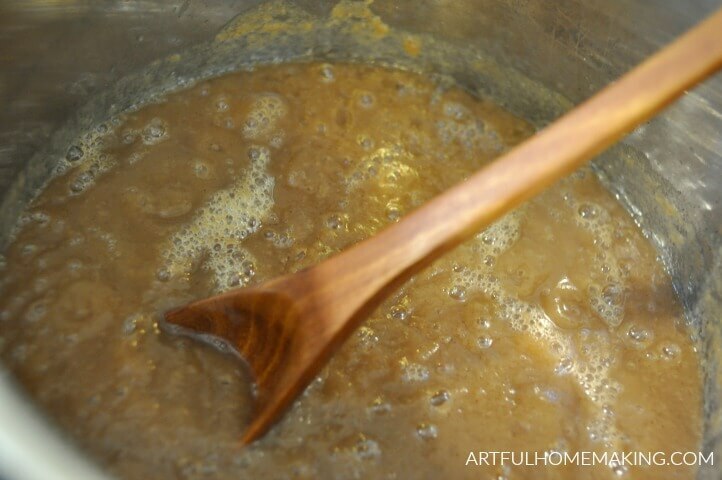 It can take anywhere from 20-45 minutes to reduce and thicken the apple butter. You’ll know it’s thick enough when it falls from the spoon in sheets and part of it clings to the spoon. 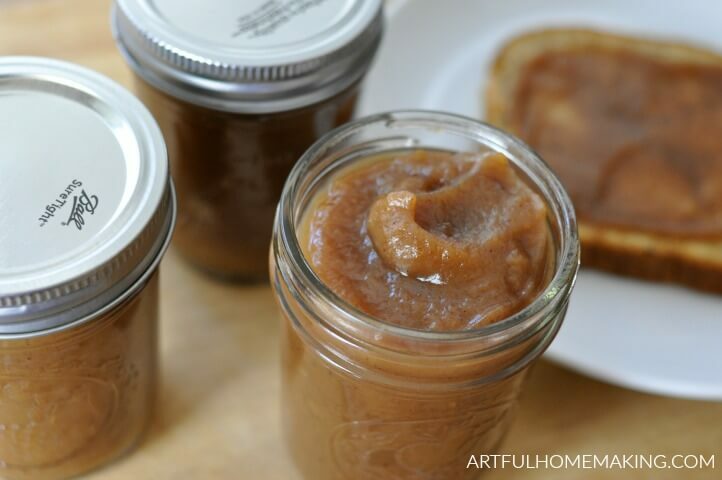 When your apple butter is as thick as you want it, ladle it into jars and then refrigerate. This recipe makes a little over three half-pint jars. And it doesn’t last very long at our house! If you have more than will fit in your jars, make yourself a piece of buttered bread with apple butter on top and enjoy! This is one of my favorite fall flavors ever. 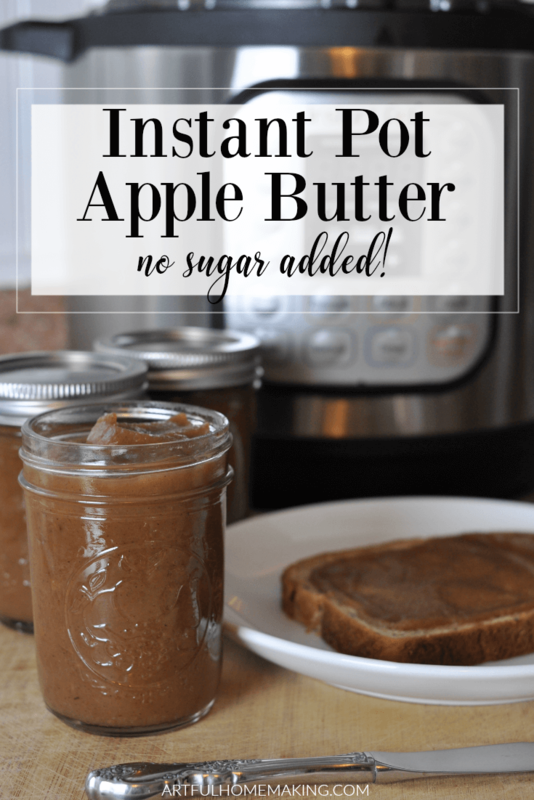 Instant Pot apple butter with no added sugar is simple to make! Save time by using your pressure cooker. 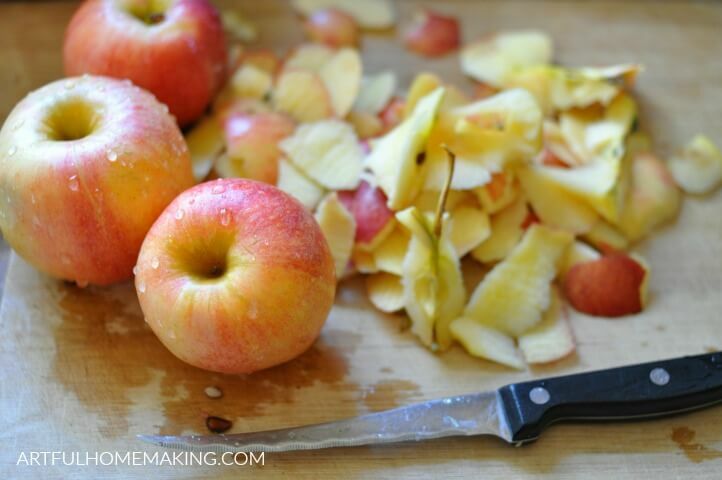 Add apple slices, juice, and spices to the insert of your Instant Pot. Put the lid on the Instant Pot, set vent to sealing, then press the manual button and adjust the time to 20 minutes at high pressure. After the cooking time is over, quick release the pressure. Remove the lid and puree the cooked apples and spices with an immersion blender (or you could blend it in a regular blender). Blend until everything is smooth and free of lumps. Press the saute button on the Instant Pot, and then press the adjust button until it goes down to "less," which will put it on a lower setting. 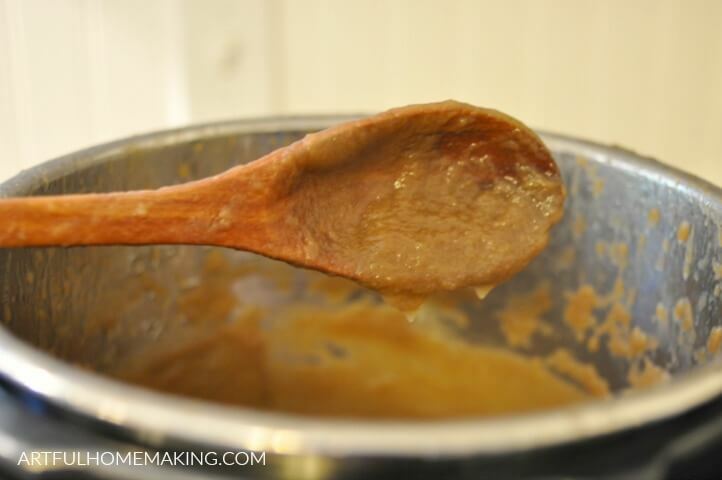 With the lid off, stir the apple butter frequently while it boils, for 20-45 minutes until it thickens. Use caution with this step, as the mixture occasionally may splash up, and it's very hot. Continue boiling until it's as thick as you want it. After the apple butter reaches the desired thickness (I cook mine until it falls off the spoon in sheets, and some sticks to the spoon), then let it cool. Ladle it into jars and store in the fridge for a week, or you can also freeze it in freezer jars or can it if you'd like. Thanks for sharing such an amazing recipe. It looks really tasty. Hi! The recipe said to add apple juice but it is not in the ingredients. What type of apple juice did you use? Can be done with water instead? Hi Karina! I’m able to see the apple juice in the ingredient lists and on the printable recipe card. I just used regular, unsweetened apple juice. But yes, you could use 1/2 cup of water instead of the apple juice. It might be less sweet, but it would work. This looks wonderful!! I wonder if there is a way to make it in the Crock Pot, as I do not have an Insta Pot. But I love some Apple Butter! Especially homemade and no added sugar! Yum! The Crock Pot works well for apple butter too! My kids couldn’t believe this had no sugar since it’s so naturally sweet! Thanks Kelly! We’re just about to make some more of this—it went fast here! Yes, it’s really easy to make!